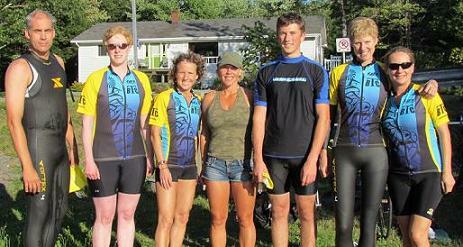 2013 will be the third year the Bridgewater Triathlon Club will offer the very popular 'My First Triathlon' program as part of the Fancy Lake practice series. Once again, triathlete and personal fitness instructor Tammy Slauenwhite will lead the sessions that take participants through all the stages required to successfully complete a triathlon. The program is suitable for all fitness levels, ages 12 and up. Do I need a bike? I don't swim, will you help?? What is triathlon??? ... bring all your questions to a free information session to be held at the HB Studios Sports Centre conference room on Thursday April 25, 2013 starting at 7:00pm. At the conclusion of the 'My First Triathlon' program, participants are welcome to join in the regular Fancy Lake program that continues until Thursday August 15th.